IN HARMONY WITH YOUR NATURE Zero Gas, Zero Emission, 100% Electric, 100% Pure Pleasure! 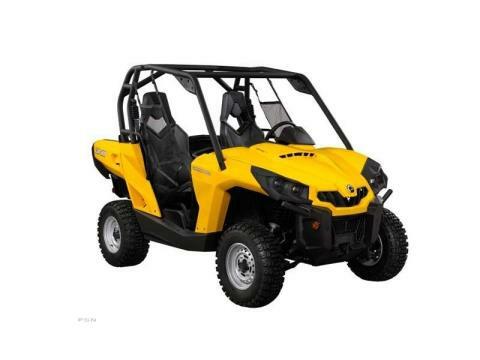 Be among the first one to own the 2013 Can-Am® Commander™ Electric side-by-side vehicle. Powered by an 48V, AC induction, air cooled electric motor and 9.4 kWh of maintenance free Lead-Acid batteries which means that you will never need a drop of gas to cruise in your neighborhood or meet friends at the local hot spot. BRP created the Commander™ Electric side by side vehicle for comfort, safety and convenience. It’s 100% gas free with no emission making it the perfect vehicle to tour the neighborhood, do your shopping or explore nature at its best with this ultra quiet and smoke-free vehicle. Zero emission, ultra quiet and loaded with rider-focused features, this advanced ergonomic vehicle offers a choice of over 50 accessories. The Can-Am® Commander™ Electric side-by-side vehicle for those who want to reduce their carbon footprint. Quietly make your way into life and be in harmony with your nature.